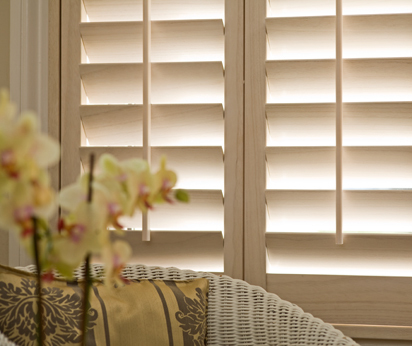 Interior Shutters are 99% of the time fitted by experienced fitters working for Shutter Dealers. It is possible of course to buy them DIY and either fit them yourself or have a tradesman fit them for you but the time, risk and stress will probably negate the saving. In the USA, where these products originated, shutters are fitted to timber frame buildings and window surrounds which, by and large, are square. The UK’s housing stock invariably does not have these properties, window openings rarely have the same width the entire height and sills are not normally perfectly level. Apart from sash windows, (which are relatively easy to fit shutters on,) casement windows and doors have intruding skirting boards, picture/dado rails and other obstacles such as telephone lines exactly where you want to place the frames, making the task more akin to shop fitting than pure carpentry. That said, CustomWest, over the last 10 years, has developed the shutter ranges and associated frames, to suit the local conditions. Shutters are fitted to Frames and Frames are fitted to where the shutters are going to hang. It is never advisable to hang shutters directly off the existing structures, such as deep window frames or door surrounds because it is the frame which is altered to get opposing shutters to meet perfectly and to hang straight. It is virtually impossible to measure accurately enough to have multiple panels, hinged together, made in wood, fit to the millimetre, an existing opening, perfectly. With the light behind any gap will be very noticeable. The experienced shutter fitter will fit to best endeavour but it would be fair to say that you will never get 100% perfection with fitting true and square panels to openings that are not true and square but the on-site adjusted frames will take out most of this and you will end up with openings that appear more square than before the shutters were fitted. Shutters can be fitted to windows, doors, glass roof spaces and used as partitions. Here in the UK we have 2 basic types of windows, casement and sash. Casement Windows, which appeared mainly after 1925, open outwards and are fitted on the outside of the house with a window sill, normally of about 8 inches, 200mm. In these cases we try to fit as close the window as possible, avoiding handles hitting louver blades of course, and opening perpendicular, normally protruding into the room about as much as a radiator would. If you want the shutters to fold back against the walls then you need to fit flush with the opening and we have a Z frame which fits around the corner of the reveal that makes this an easy and good looking option. Patio Door and Partitions with wide openings over 2.5M usually will use a track at the top suspending the shutters, for wider opening there may also be a bottom track to guide the shutters and keep them firmly in position. Tracked shutters can span very wide openings, some in excess of 8M have been achieved successfully. 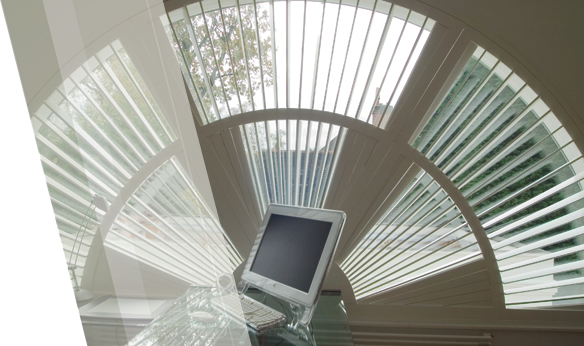 Glass Roof, Conservatory and Velux style windows are all common openings for shutters. We have developed special frames and bolts specifically for hanging shutter panels in near and totally horizontal positions. We also have remote control options for louver tilt control for those hard to reach places. Triangular and Arched windows and doors, found in conservatory roofs, apex windows and architectural features are also typical shutter choice openings. Some times they are the only shading/privacy solution possible and our shutters are very well suited to these.